The Staten Island Economic Development Corporation launched a petition to ask the state to fund a $5 million study of their plan for a West Shore Light Rail. STATEN ISLAND — A campaign to build a light rail system on Staten Island has been relaunched — nearly 10 years after the idea was first pitched. 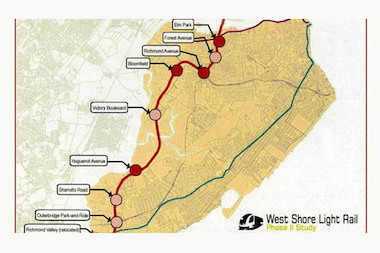 The Staten Island Economic Development Corporation (SIEDC) launched a petition last week to build the West Shore Light Rail. It plans to submit it to Gov. Andrew Cuomo when it reaches 17,000 signatures — the estimated ridership of the service. An effort to get funding for a $5 million study for the rail service got nowhere when it was first started almost a decade ago. "It fell on deaf ears. Nobody stepped up to the plate," said Steve Grillo, first vice president for the SIEDC. "We just become frustrated and said, 'Enough is enough. We have to get people's attention.'" In the five days since the petition launched, the group gathered nearly 500 signatures supporting the plan, which would build a $1 billion rail link from Elm Park to Richmond Valley and connect to New Jersey, Grillo said. Grillo said the majority of Staten Islanders would be in support of the plan because of the borough's limited public transportation, leading to the nation's longest commute times. With several new developments like a movie studio in Charleston and Fresh Kills Park that could bring more workers and people to Staten Island, Grillo said it was time to get the project off the ground. "We can't wait for these projects to come online and then have a problem and think about transportation," he said. "It takes a long time and we're saying give us the $5 million now and we can start putting together the plans so that five years from now we can actually build the thing." The Alternative Analysis study, which delves deep into the nuts-and-bolts of the project, is one of two evaluations needed before it can get off the ground — the other being the Environmental Impact Statement. Even though the SIEDC funded its own studies on the light rail in 2004 and 2009, the Alternative Analysis needs to be funded by the state, Grillo said. While the group is a long way from 17,000 signatures, Grillo doesn't think it'll be a problem to reach the goal. "We know it's only the beginning," Grillo said. "There's no one on Staten Island that doesn't think we need better mass transit. We've been working at this for 10 years, I think people are going to be committed to it."